The East African Court of justice found the proposed road through Tanzania’s Serengeti national park unlawful due to expected environmental impacts. The court ruled against the controversial plan which is a relief for the Serengeti eco system. The case which has taken four years to receive a definitive ruling was brought to the regional court by the Africa Network for Animal Welfare (ANAW) in 2010. The road, which would have bisected the northern—and most remote—portion of Serengeti National Park has had many ups and down. The plan was opposed by the UN, USA and German governments and the Tanzania tourist lobby. The Tanzanian government following all the opposition adjusted its plans from a paved road to an unpaved one, a plan which critics say would have eventually ended up as a paved road running through the park which would have brought a lot of traffic across the ecosystem which is the Serengeti and eventually cutting off the great migration. The new ruling by the East African Court of Justice, removes the threat of a paved road for the time being. Josphat Ngonyo ANAW’s Executive Director said that much as they fully respect Tanzania’s sovereignty and need to develop, by taking up the matter ANAW was protecting a resource that would be of future benefit to Tanzania, East Africa and humanity as a whole. The Tanzanian government was quite dismissive of the ruling despite it being a roadblock for one of president Jakaya Kikwete promises. Minister for tourism and natural resources Mr. Lazaro Nyalandu said the government had already made up its mind not to build the road. Earlier this month, the Tanzanian government announced its intention to go ahead with a German-funded study for a different route for the commercial highway. This particular route would completely circumvent the park and it is one option that was raised by conservationists and foreign governments alike. The court ruling might have been a win for conservationists and all those opposed to the road, but the northern Tanzania communities were looking forward to the road to give them access to more populated areas. The Serengeti is one of the reasons why Tanzania is a popular destination for tourists looking to enjoy Africa safaris. It is home to a variety of wildlife and also a stage for one of the greatest shows on earth- the great migration. 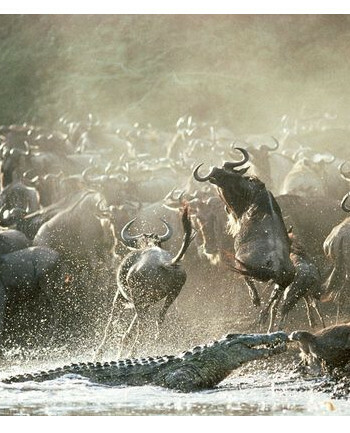 Every year, about two million wildebeest, antelope, and zebra cross the Serengeti plains. According to research, the highway, if constructed, would cut the wildebeest population on that trek by 35%, lead to an increase in poaching activity, and wildlife collisions. It would generally disrupt the ecosystem. Tourism in Tanzania is heavily dependent on natural reserves such as the Serengeti and the Ngorongoro, any disturbance to these major tourist attractions could easily have a negative impact to the sector.